Lionel Messi broke his goal duck against Chelsea to deny Antonio Conte's side a crucial lead over Barcelona in their Champions League showdown. The Argentinian superstar had not scored in his previous eight meetings against the Blues, but he put that anomaly right with 15 minutes left to secure a 1-1 draw at Stamford Bridge. Chelsea had gone ahead through Willian, who had earlier been twice denied by a post. But Blues boss Conte, who revealed he had experienced trouble sleeping ahead of the match, will be having nightmares about the equaliser with his side unable to hold on for a crucial advantage to take to the Nou Camp for the second leg in three weeks. The showdown between the current English title holders and Spain's champions-elect was also billed as Messi against Eden Hazard, with the two illustrious number 10s facing each other for the first time at club level. Hazard, spearheading the Chelsea attack with Willian and Pedro tucked in behind, certainly looked in the mood to show he deserves to be mentioned in such exalted company and fizzed an early 25-yard drive narrowly high and wide. But it was Messi who eventually came out on top. Messi was also looking menacing in the opening stages, with one sudden burst of acceleration leaving N'Golo Kante, Cesc Fabregas and Antonio Rudiger grasping at thin air. The 30-year-old then collected Andres Iniesta's pass on the corner of the area and chipped an inviting ball onto the head of Paulinho, who should have done far better than nod tamely across goal and wide. In fact, Messi's mere presence was giving Chelsea's defence the jitters - Andreas Christensen passed straight into touch to give away the cheapest of corners and Thibaut Courtois was lucky to get away with a mis-hit clearance. Barcelona's possession stats were touching the 80 percent mark during the first half an hour, but crucially they had not tested Courtois. 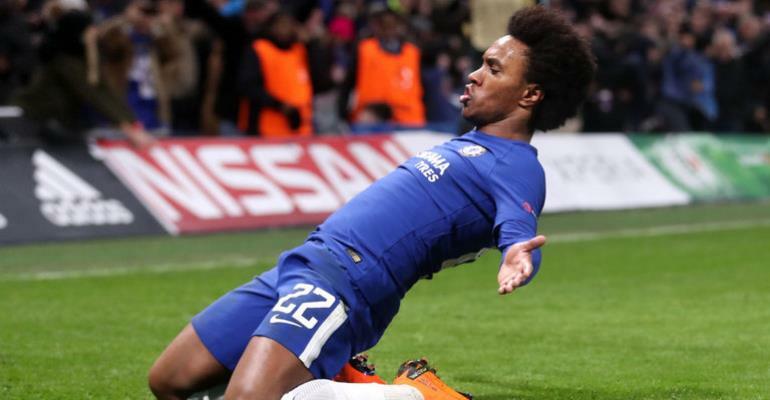 Chelsea, meanwhile, earned some respite when Ivan Rakitic was booked as he tripped a rampaging Willian, with Marcos Alonso's free-kick held by Marc-Andre ter Stegen. Moments later Willian collected the ball from Hazard, cut inside and crashed a powerful curler against the far post with Ter Stegen well beaten. And with five minutes of the first half remaining Willian's snap-shot from the edge of the area clipped the outside of the opposite upright. After the break, Luis Suarez fizzed a shot across goal and wide, but it was Chelsea who broke the deadlock as Willian made it third time lucky. From a short corner Hazard spotted the Brazilian unmarked on the edge of the penalty area, and Willian took a touch before arrowing a low shot beyond Ter Stegen and, this time, inside the post. Christensen's suicidal pass across goal left Cesar Azpilicueta scrambling in vain and allowed Iniesta to cut the ball back to Messi. He had been denied with his last 29 efforts on goal against Chelsea, but he made no mistake with number 30.